About a year or so ago, I took a computer class in college, and my teacher thought a good way to teach the history of computers would to play a movie. Well, I don’t disagree, because the movie he chose was Pirates of Silicone Valley. If you aren’t aware of what this movie is about really, it’s simply the history of both Apple and Microsoft, focusing on the lives of both Steve Jobs and Bill Gates. 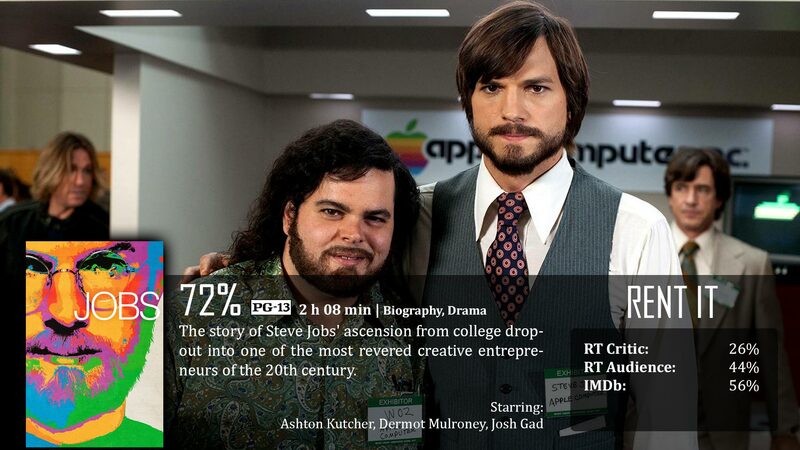 Now, in 2013 we have a film about Steve Jobs headed up by Ashton Kutcher in the lead. The two probably shouldn’t be compared, but it’s hard not to, given the similarities in the films…Jobs could practically be a remake; but how well did it do? A lot of you probably already know the story of Steve Jobs, but if you don’t, it’s pretty simple. Steve is a genius, but he’s also a greedy pathological liar that really doesn’t care a lot about anyone else other than himself and the future of Apple. He and a small team of employees built Apple from the ground up from within his garage, regardless of the fact that people continually told him that no one would ever want a personal computer. Of course, his strictness and passion for the company made him look like a jerk, but he knew his stuff, and he is ultimately responsible for making Apple what it is today, the most profitable company around. First of all, the casting in this film is phenomenal – as far as looks go. Giving us a visual comparison in the end will prove that there was some serious thought put into the casting, makeup, and costumes to make these guys really look perfect. 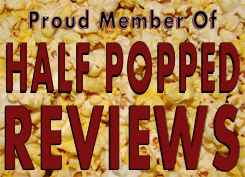 Their acting was also pretty good, I don’t really have qualms about it, but I’m also not feeling like the acting was mind-blowing or award-winning. It was just…pretty good. Kutcher really honed in on the spirit of the jerk that is Steve Jobs while also getting the idea of Job’s innovative ingenuity that Jobs was famous for. It wasn’t the best presentation, but it was believable and it’s able to keep your attention at any rate. Pirates of Silicone Valley was good because it didn’t only go over Steve Jobs’ life, but also that of Bill Gates. Both stories are great, and they both go together, no matter what you think. I get that they wanted primary focus on Jobs, but seriously, Bill Gates plays a vital role in this. When Macintosh came out, Bill Gates secretly took a tour of Apple, and got a developer’s first look at the computer, and ripped it off for Windows. Guess what? This happens in the movie, but it skips the whole tour, and all you know is that Gates ripped them off. So when Steve Jobs calls Bill up, you don’t even get to see Bill in that scene. There’s no reason to completely cut him off, even for that one scene. This is another underdog film, and as such, it’s not horrible. It’s also not amazing. You get this overall feeling that the filmmakers wanted to make a movie about Steve Jobs, and that was what they did. No passion, no reason other than “just because”. I mean, they did a decent job as far as how it looked, and getting history right, but if I wanted to see the story of Apple, I’d go ahead with the older, smaller budgeted Pirates of Silicone Valley because even though the actors in that film didn’t look identical, they had a passion, and that passion seeps through and makes its way to what we honestly want to see in a movie. Jobs was able to maintain some historical accuracy and uncanny appearances, but the passion was a bit lost, almost feeling rushed to get through the story. It’s not bad for a single viewing, but I couldn’t imagine anyone wanting to purchase it. Kutcher tries, but the rest of the movie just can’t help but take him down by its route of bad decisions. The same bad decisions that got him in the lead role in the first place. Good review Dave.